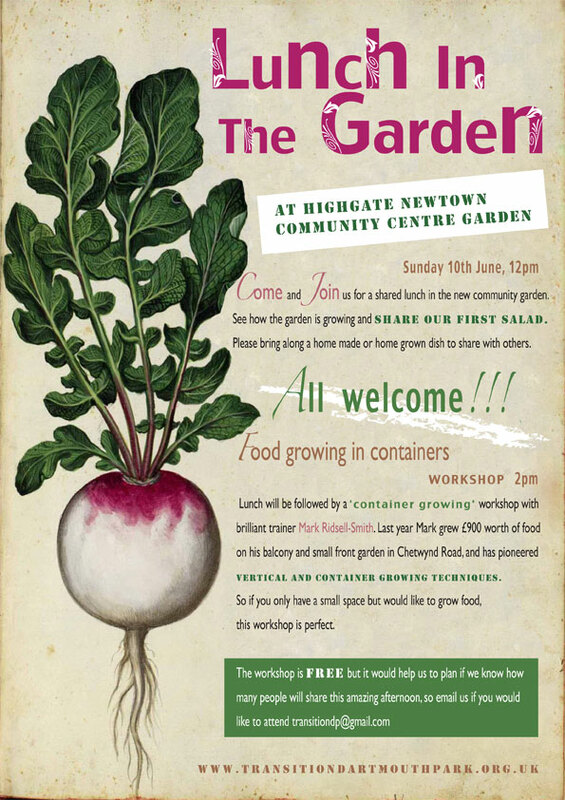 This is the story of the first year of the Transition Dartmouth Park community garden, based at Highgate Newtown Community Centre (HNCC), and of the people who created it. Since deciding to embark on a food growing project at our open space meeting back in January, we worked in parnership with the community centre, and they allowed us to clear and transform their disused garden. 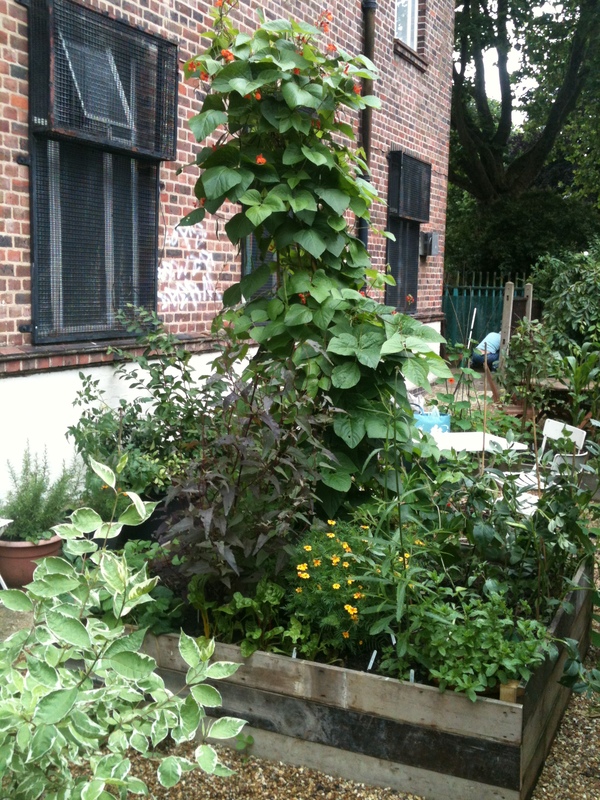 Our aim was to learn, teach and inspire others to grow food, and to provide some fresh food for the HNCC cafe. Our first look at the garden, on a rainy Sunday afternoon in January was quite daunting. 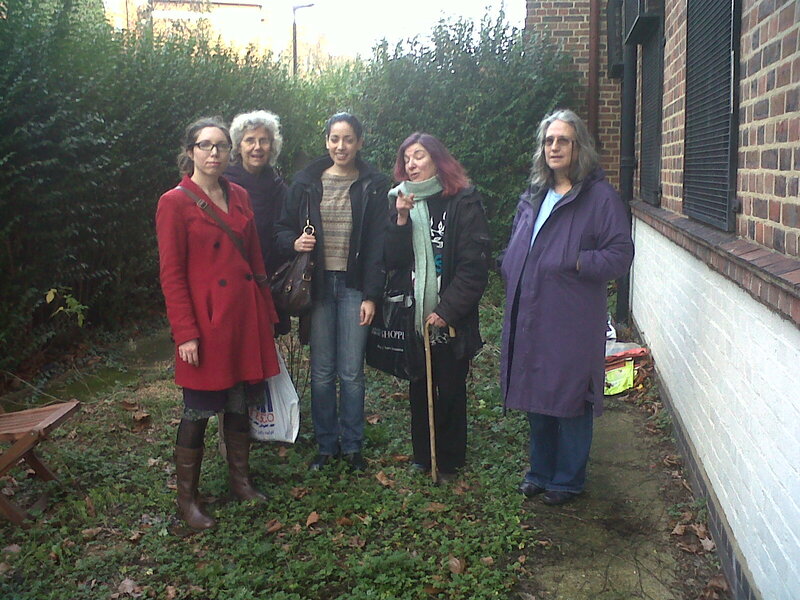 The garden is north-facing, shaded by the community centre, and overgrown hedges blocked out most of the light. It was covered in weeds, and piles of fallen leaves from the London plane tree just outside the gate. Feeling slightly overwhelmed with the task ahead, we invited urban permaculture teacher Rakesh Bhambri to run an ‘Intro to Permaculture’ course. The course was wonderful, and thirteen of us learnt the principles of permaculture, how to observe and design our space, and most importantly what we could grow in such conditions. Our plan made, we gathered on Sundays to cut the hedges, clear the leaves and most of the (non-edible) weeds, and eventually to build raised beds from salvaged floorboards from refurbuished flats on the nearby Holly Lodge estate (with a bit of help from Ian, a carpenter who lives above the community centre). At the end of March we held a ‘Seedy Saturday’ at the centre to network with other local growers, let people know about our project, and of course to get some seeds. 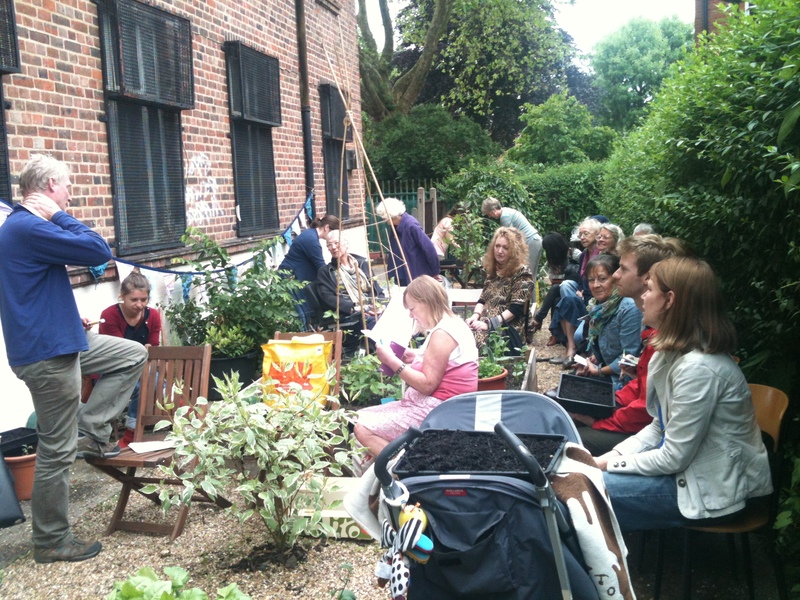 We had some brilliant workshops from Tom Moggach, who brought along delicious salad; and from Guerilla Gardener Richard Reynolds, among others. The best bits were some local children bringing along their home-incubated bantam hens and setting up a pen in the middle of the community hall(!) – that and seeing the previously dank and disused garden suddenly filled with sunshine and people eating lunch. In mid-April we had a huge delivery of five tons of municipal compost and were amazed by how many people came to help us move it with shovels and wheelbarrows to the garden, and to other local food growing spaces in schools and on estates. We started planting, our spirits undampened by six weeks of rain, and despite the weather our garden began to bloom – first our salad, then our runner beans began to climb their canes, broad beans rose from the soil and the herbs flourished. Worms multiplied in our new wormery. 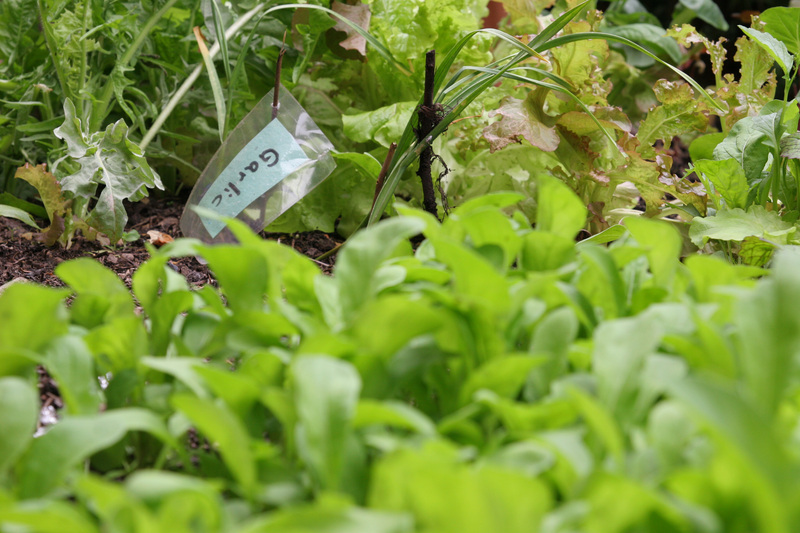 In June we invited all who had been involved, neighbours, and community centre users, to bring along lunch to share and to harvest the first salad. We feasted on delicious homemade food; filled bowls with lettuce, mustard leaves, pak choi and oriental greens; and chatted to those we knew and others who were joining us for the first time. On the same afternoon we were joined by container growing guru Mark Ridsell Smith for a workshop and ended the afternoon with our own trays of newly planted chilis and beanshoots to take away. We were also working on a project with students from Central St Martins who looked at designing ways to tell the story of the garden and engage more people. That day they presented us with a beautiful prototype – a book for us to write our stories and messages, and enlisted garden users and visitors to fill in in. Workshops continued monthly with Master Gardener Anita Gracie, local herbalist Kimberly Walker and our permaculture teacher Rakesh all popping in for weekend advice sessions. We also added a second weekly session on Tuesday afternoons, led by Claudia, a local mum with a passion for gardening, whose children attend the gymnastics class in the community centre at the same time. It has proved popular with parents and kids as it is held at the centre’s busiest time of the week. It has been hard to keep the momentum of weekly sessions – all of us work, garden at home and have other community commitments – but we’ve had a consistent core of people involved from the start, and the workshops have brought people along. The permaculture course and workshops have also been useful to others in the area who are learning to grow; our Transition garden sharers, a local tenants association and the organisers of our primary school gardening club have all attended. Our crops have been pretty good – we were lucky that the garden was designed for very little sun, slugs and snails took a long time to find the new raised beds, and the municipal compost drains well and stays moist. Our salad crop was fantastic and so were our runner beans, nasturtiums, herbs, wildflowers and several kinds of spinach (including Russian Red). Yellow and red cherry tomatoes flourished (eventually) in pots and the sunny spots and even our baby sweetcorn did well. But snails ate one cougette plant after another and then moved onto the peas. Kitchen staff have gradually started to add some of the produce and herbs from the garden to their cooking as well as using the wormery for their veg peelings. Catharine observed that what has been amazing about the garden is that we started it with no money and very little skills or experience, but still made it happen. We found that asking for help – seeds, advice, compost, wood – was always rewarded with us not only getting what the garden needed but also with more people becoming involved and us forming greater links with our neighbours and other local food growing projects. The project was conceived not only as a chance to grow and eat food locally, but as part of Transition Dartmouth Park’s initial awareness raising and outreach. Locating it in the community centre and using it for public events, including the centre’s own summer party, has definitely helped to achieve this. The community centre has been amazingly supportive and like what we have done so much, they have agreed to allow us to begin work on their second garden. We’re also discussing the possibility of turning some of the community centre car park (south facing and sunny) into a space for allotment bags for people locally who don’t have their own growing spaces. In September we celebrated the harvest and Transition Dartmouth Park’s first birthday with a potluck BBQ lunch, potato harvesting session, and listened to some winter growing advice from Anita. We shared food, including a huge squash we grew in a container, at birthday cake and there were children’s activities. Most importantly it was a celebration of all that we have learnt over the year and the neighbours we have met and become friends with. Gardening will begin again for spring in March 2013, with a spring planting workshop on Saturday March 23rd. Photos: Our first look at the garden in January; Dean and Luca making raised beds in April; Workshop at Seedy Saturday in March; Mission Compost in April; Midsummer lunch and container growing workshop in June; Our salad in June; The garden in June; Our amazing runner beans in August.